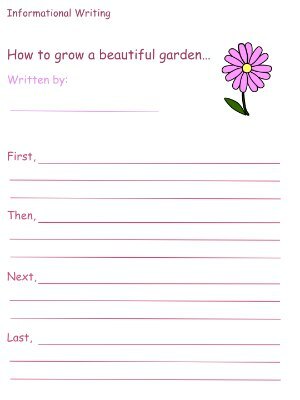 Print out the informational writing activities with paragraph transition words to get your children writing! Your child may choose to focus his or her own paragraphs on the themes within Persephone, or he may let his imagination run wild. Anything is possible with fiction! I think these informational writing activities provide children with an alternate means to really get their ideas out! Complete the paragraphs provided, using the step-by-step formula, "First,... Then,... Next,... Last,..."
Allow yourself to get really creative and do not be afraid to get silly! Read your steps out loud!